The writing process is the process that I am the most familiar with. It is drilled into the minds of children from a young age as an ideal way to approach written assignments. Due to its straightforward and simple layout it is able to make an imprint on young minds. 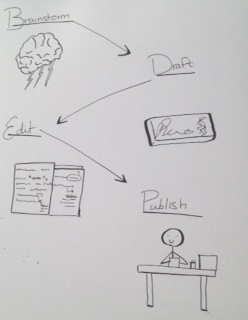 The process starts with brainstorming (or in some versions “prewriting”). This emphasizes thinking about the structure, format, and goal of an assignment. Then the process moves on to drafting, or getting everything on paper as quickly as possible. Then the writer is encouraged to revise their work in the editing phase of the process. The editing phase encourages a very limited revision, often coming down to one editor, or self editing. Finally the process finishes with publishing. This process is quite successful in a wider sense due to its simplicity and applicability. However I believe the process loses something important in its simplicity. Through emphasizing a very linear and specific process, it hems writers into a very formulaic way of completing projects. There is little emphasis on audience, unlike in the design example. I believe that if writers were encouraged to think more about their audience, and in their specific message or goal (rather than the obvious goal to “not fail my class”) and share the editing with multiple people, rather than a designated editor, their work would flourish. This is where classes like creative writing tend to tweak the writing process, and often with great results. The writing process is very rarely drawn, it tends to be represented with single words, fun colours, and interesting fonts rather than in drawings. I learned that the ink pen I bought absorbs more slowly into the thick lovely sketchbook than my scrap sheets. Pardon the smudges.